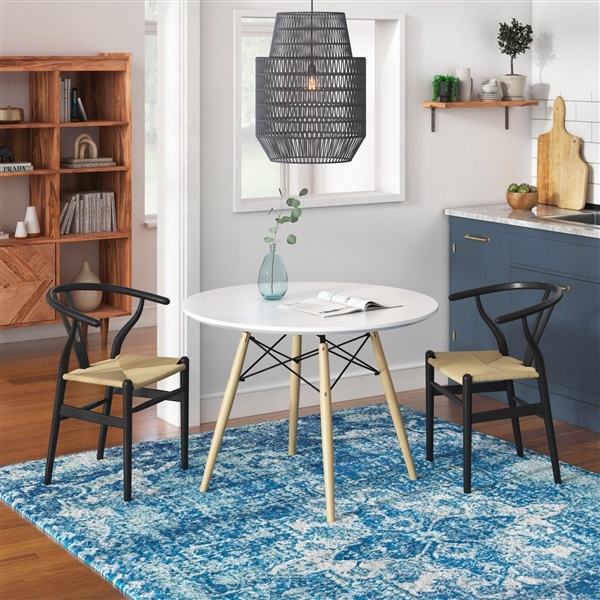 A clear homage to mid-century style, the Eiffel Round Dining Table (Small) was designed with versatility in mind. The white powder-coated top is practical, simple to clean and stylish. Its size is perfect for small intimate spaces, apartments and compact spaces. The iconic eiffel base consists of four solid wood dowel legs in a natural finish and black powder-coated criss-cross frame. GREAT STYLE, FITS THE RIGHT AMOUNT OF PPL, SOLID DESIGN! Thought the assembly would be difficult but it was fairly simple! VERY HAPPY about this!! I had a friend tell me that if you are unsure how to redesign your home, find a style, color or feature of a furnishing you really enjoy and than work your way from there - this was the next addition to my kitchen - EIFFEL BASE ALL THE WAY! Size fit even better than I imagined it would. Colors even match so well, the table almost looks custom designed for my kitchen. It was also easy to assemble and ship time was fast. I am entirely happy with my order and I will be undoubtedly be shopping here again! Great table - looks good. A bit tricky to assemble, but not bad. Very easy assembly and beautiful base - arrival time was quick and the size, shape and color fits like a charm!! Very cool architectural looking design, happy with my choice! space saving, cute design and nice quality! How much does the table weigh? The Eiffel Round Dining Table (Small) weighs about 25 lbs. Is the diameter of this table top really 31.5 inches? I have ordered similiar models that said this but were actually 35 inches.